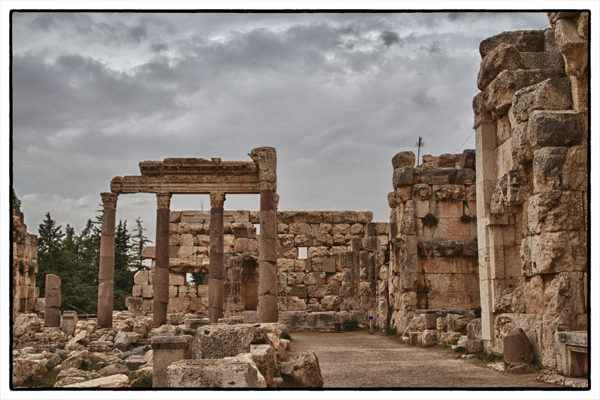 A few more photos from the Roman ruins at Baalbek. These six Roman columns have survived wars, earthquakes, and the elements for over 2,000 years. Photos by David Lansing. 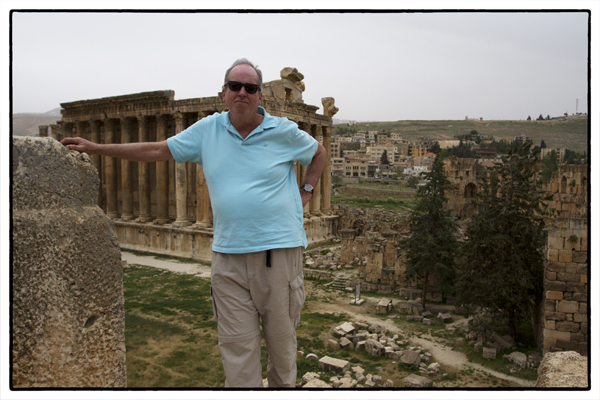 I’m walking around the Roman ruins at Baalbek taking hundreds of photographs and yet feeling a little bit frustrated. Because I realize as I look at the images in my view finder that they don’t really convey the scale of these buildings. At one point I was standing off to the side of six granite columns—the only six still standing from what used to be 54 columns—said to be the largest in the world. Each is over 75 feet tall with a girth of over 7 feet. How they were moved and positioned so precisely remains a mystery. But even though you have a photo to look at and I tell you they are over 75 feet tall, I don’t think you can really get how big these suckers are. And that’s what was frustrating me. Until a young Muslim family comes along and the father decides to take a photo of his wife balancing their young son at the foot of one of the columns. That’s the photo below. With the woman, in black, not even as high as the column’s pedestal and her son looking like an insect on a massive tree limb. Perhaps that can give you a sense of just how big these columns are. And then ask yourself: How, 2000 years ago, did they get these granite columns where they are? And how did they get each part to stand atop the one below it? 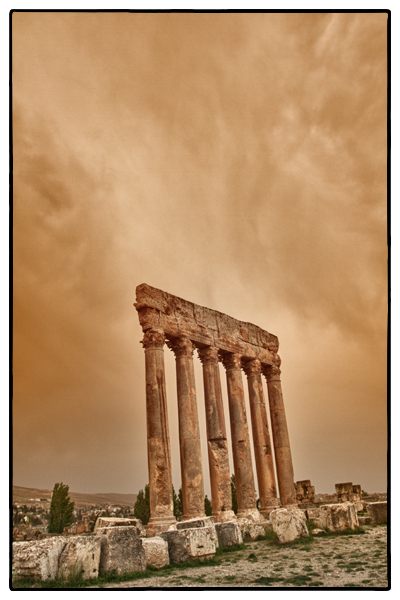 The Temple of Jupiter in Baalbek. To give you an idea of size, look for the tiny people in front of the temple. Photo by David Lansing. 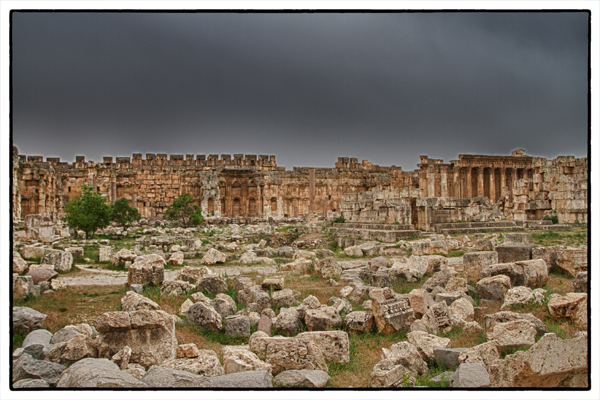 The Roman ruins at Baalbek are immense and wondrous and totally spooky. I’m not at all a paranormal sort of guy, but the ghosts in this place were as thick as the dark clouds overhead. Not too surprising when you realize that these temples were the site of all sorts of licentious and bloodthirsty forms of worship for centuries. And did we mention that some 100,000 slaves worked on the project from about 60 BC through 138 AD? 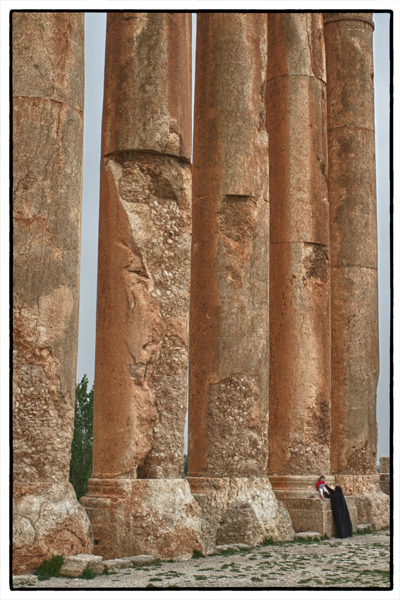 How many of those poor fellows do you suppose left Baalbek in an upright position? For hours we stroll through the spooky ruins, wandering through the Temple of Bacchus, home to sacred prostitution, taking in the immensity of the Temple of Jupiter (shown in the photo above; this is also where that 1,000 ton monolith, now called the Stone of the Pregnant Woman, was to go, although god only knows how they were going to get it down the hill from the quarry). For centuries these magnificent ruins were forgotten. They were rediscovered in 1751 by English architects James Dawkins and Robert Wood, but then ignored again following a devastating earthquake eight years later (which caused the fall of the ramparts and three of the huge pillars of the Temple of Jupiter–on the left in the photo–as well as the departure of most of the local population) until a century and a half later when Kaiser Wilhelm II visited Baalbek in 1898 while on a tour of the Middle East. The Kaiser immediately contacted the Sultan of Turkey for permission to excavate the site and for the next seven years a team of archaeologists recorded the site in detail. After the defeat of Turkey and Germany in WWI, Baalbek’s German scholars were replaced by French ones who, in turn, were replaced by Lebanese. And restoration work has been ongoing ever since. The happy couple with the Stone of the Pregnant Woman just off my shoulder. Photo by Abdul Nabi al-Afi. The woman in the above photo is Elxa Yaghlgy. Very nice girl. 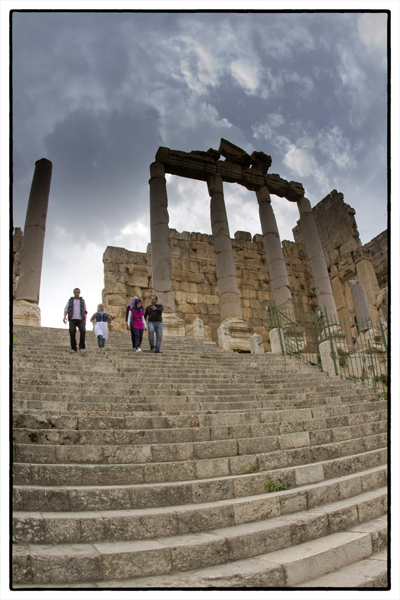 She was “assigned” to accompany us to the Roman ruins in Baalbek by the Lebanese Ministry for Tourism. 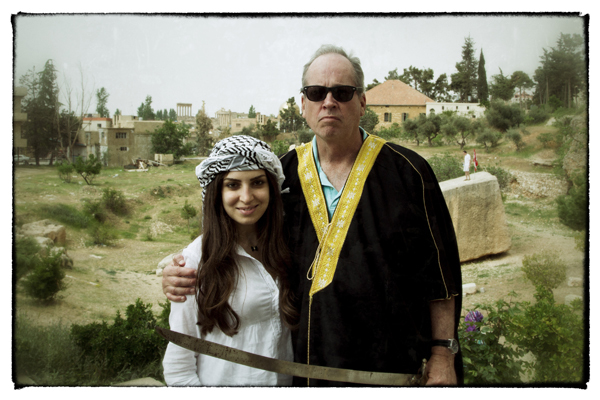 Not because she is an expert on the Roman ruins or on the Bekaa Valley (she has never been here before) but because…. Actually, I have no idea why the Ministry of Tourism wanted her to come along. Perhaps to keep an eye on us? (Her job title, according to her business card, is “Advisory Unit.”) So, yes, she knows nothing about the Roman ruins or the Bekaa Valley but at lunch she was the first to ask our waiter to bring out the hookah pipe and she laughs at everything I say, so I like her. Even if she is a government spy. Which I do not think she is. Because she’s just too darn sweet and innocent. Before we get to the Roman ruins, Elxa has a chat with our driver. I ask Elxa about this Hajar al-Hubla. It means Stone of the Pregnant Woman, she says. Women from all over Lebanon come here and rub the stone because they think it will help them get pregnant. Our driver stops and asks an old woman sitting on a chair by the side of the road about the Stone of the Pregnant Woman and soon we are meandering up a windy dirt road to what used to be a Roman quarry. Here is a little hut with a sign that says “La Plus Grande Pierre Dans Le Monde”—The Largest Stone in the World. The minute we get out of the car we are greeted by a very friendly and charming man with a salt-and-pepper mustache. His name is Abdul Nabi al-Afi. 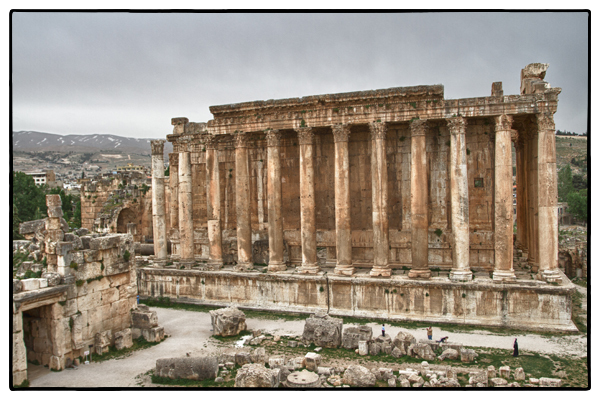 Abdul, a 53-year-old retired army sergeant, tells Elxa that he is the one who, back in 1993, discovered the 20-meter-long, 45-meter-wide, and 1,000 ton monolith which the Romans had destined to be the podium of the Jupiter Temple at the Baalbek Temple, just a few kilometers away. But the Temple was never completed and the monolith remained in the quarry, buried under mounds of trash until excavated by Abdul. Now Abdul makes a modest living selling souvenirs out the of the adjacent tourist shop. What sort of souvenirs? I ask him. He runs inside and comes back out carrying an Arab robe, a black-and-white Palestinian keffiyeh (the traditional Arab headdress), and a long sword. He thrusts the clothing into our arms. Abdul with my new wife. Photo by David Lansing. I put on the robe. Abdul wraps the scarf around Elxa’s head. Holding the sword, I put an arm around Elxa and look fierce. Like I’m ready to cut somebody’s head off. Abdul says something in approval. Elxa laughs. “He thinks I am your wife,” she tells me. Abdul grabs my camera and, after I show him how to operate it, steps back and, making sure to get the Stone of the Pregnant Woman in the background, takes our picture. He gives me back the camera and then, excitedly, chatters at Elxa while nodding towards the big stone. She shrugs. “Why not?” she says, my new wife, from the Advisory Unit of the Ministry of Tourism, happily heading off with Abdul. I mentioned yesterday that one of the many, many dishes we had at lunch was a Lebanese chicken with rice dish. Waffa says it wasn’t rice; it was freekeh. Freekeh is a very unique Middle Eastern ingredient. It’s a green wheat that is harvested before it is completely ripe and then smoked. According to Waffa, it came about a couple thousand years ago when the Romans were marauding through the area. After they’d done their plundering and pillaging, they’d set the fields on fire in order to destroy the wheat, condemning the local people to ruin. Instead, trying to save whatever they could, the locals collected the burnt grain from the fields and, after cleaning it, discovered a toasted grain that was green and very nutritious. Most of the freekah in Lebanon comes from an area called Jabal ‘Amel, a mountainous region in southern Lebanon. After being harvested by hand, the wheat is left in the sun to dry for 24 hours. It is then spread on stones together with branches from a particular local shrub called balan. The balan is the fuel for an intense and very quick fire that burns the husks while the grain undergoes a rapid and even roasting. This stops the aging and gives the freekeh its characteristic toasted aroma. 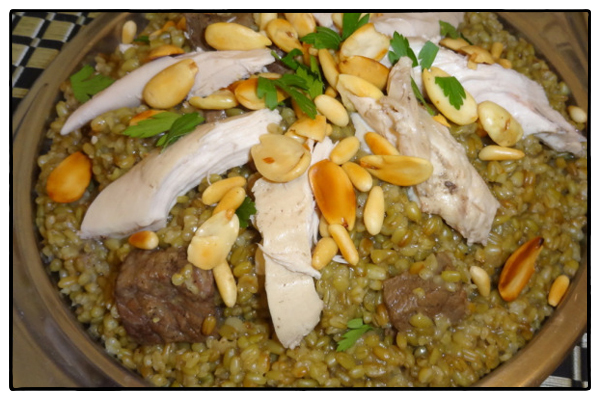 Waffa says freekeh is much higher in protein, vitamins, and minerals than normal wheat. It also has a fiber content four times higher than rice and is rich in calcium, potassium, iron, and zinc. And to think that it was accidentally discovered thanks to the nasty intent of marauding Romans.